I saw the snake as I bent down to move the wooden bench and instinct demanded a hurried step backwards. I complied. A double take reassured me it was a fake snake, tucked away in the leaves for some perverted amusement or simple childish pleasure, who knows? As my heartbeat slowed, I looked longer at the vine covered fence. Well, there were purple berries there! Oh, hey! They aren’t purple berries… they’re grapes!! I planted two grapevines at my house this spring. They’re still alive, but that’s about all I can say. They really haven’t grown too much. But this spot, wow… the more I looked the more I saw! I popped one in my mouth. It had great flavor… and seeds! It’s been a long time since I’ve eaten a seeded grape! Some weren’t even ripe yet, but I gathered a pan and kitchen shears and went to snipping. I’ll have a visit with the extension agent and see if I can find out what variety they are, but now they’re cooked and strained and ready for jelly making soon. 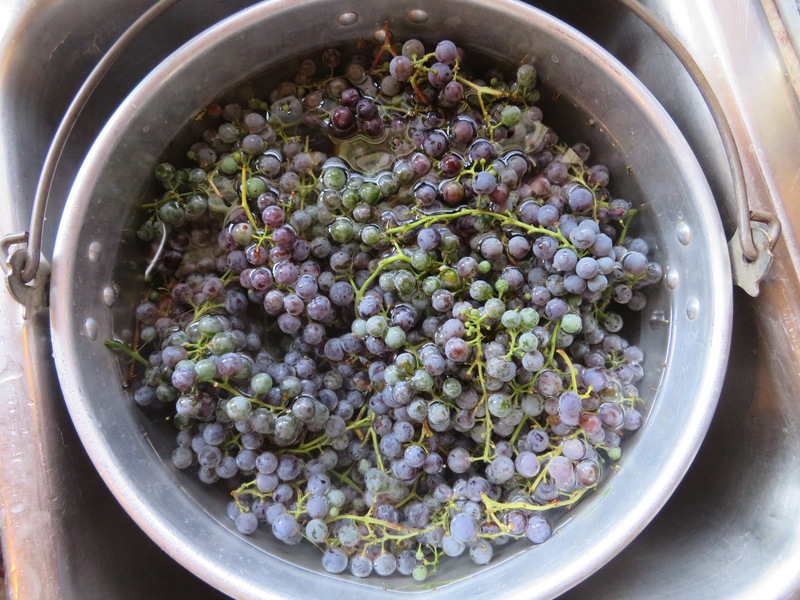 It won’t be tomorrow as there’s cow work a’comin’… but a double batch of home made grape jelly is coming my way! It was a great discovery thanks to that ornery little snake! Good luck with the grapes. I love homemade grape jelly–made it for years. Yum. That’s a better surprise than a snake….grapes are good!! They look in size & color just like the wild grapes down here, but those pack quite a punch in flavor, not so much sweet though. I have yet to get any tame grapes to survive. Keep us updated plea! Will be interested to learn what kind of grapes they are — look something like my Concords which will be getting ripe soon. Home made grape jelly is the best! A great find Carol. Enjoy the jelly once it is made. Hope the cow work goes well.